Red Oak, a very hard and heavy wood is grown on all continents. Red Oak is reddish brown in color with a noticeable narrow straight grain. It is used for furniture, cabinet making, flooring and boat building. 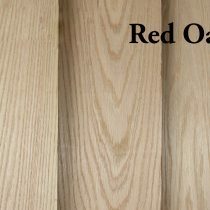 Red Oak is one of the more common hardwoods used due to it being economical and readily available.